Welcome! It’s easy to get started. The National Forum for Black Public Administrators (NFBPA) Connect is an online member community that allows you to network connect, learn, and share with colleagues from the principal and most progressive organization dedicated to the advancement of black public leadership in local and state governments. We’ve put together this handy guide to show you the basics and help you get the most out of your new member benefit. Communities - Go ahead, look around. You can get to NFBPA Connect by visiting NFBPA Connect directly, or visiting NFBPA.org and selecting it in the navigation bar. Either action which will prompt the Member Login screen, if you have not already provided your credentials. Use the All Communities link in the navigation bar to see each of the communities in which you currently have a membership, or are available to join. You can also use this link to get an idea of each of the communities’ activity, such as the number of posts, files uploaded to the group’s resource library, and the current number of subscribers. Communicate - Participate in the conversation. All communities feature integrated online discussion groups. Select a community, such as the Open Forum, and click the Discussion Tab, towards the upper left-hand side of the page, to get a conversation going! 1. Click Post New Message to start your own discussion thread! Note: We encourage you to tag your document to increase its “searchability” and to help other members find it in a snap. Tags are topical areas that help to classify community content. 2. You can view any thread by clicking on the thread subject. 3. When viewing a discussion thread, you’ll notice a blue button with dropdown to the right of each message. The Reply to Sender button sends a private response to the author of the post. The Reply to Discussion button sends your response to the entire group. 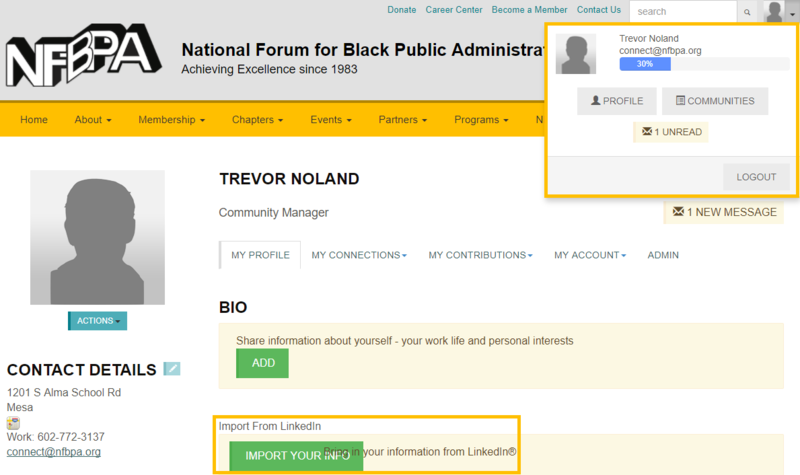 We’ve used your information from our NFBPA membership database to complete the basic parts of your new profile, including your name, organization, and professional designations. Now, make it yours by filling out areas like your educational history and interests; this information will help other members find you and connect. Alternatively, you can automatically populate your profile through your LinkedIn account! Simply navigate to your profile page and click the Import from LinkedIn button. Don’t forget to upload a picture of your smiling self! Doing so helps add to the community feel and allows other members to get to know you better and builds trust! Note: Don’t want everybody to see everything on your profile? No problem! Just click “My Account” from the profile navigation bar and click “Privacy Settings”. • Real Time: you’ll receive an email for each new community post immediately after it’s submission. • Daily Digest: you’ll receive an email each morning with the previous day’s posts. • No Emails: read and reply to posts through the community without any email notifications. Member Directory- Make new friends and reconnect with old ones. Look for other members by name, company, or email address, by using the Member Directory link in the navigation bar. Or, dig deeper by using the Advanced Search function to look for members by areas of interest, location, and so much more. Once you’ve found the person that you’re looking for, you can view their profile, send a message, or add them as a contact directly from the search results page. Resource Libraries - Don’t reinvent the wheel. 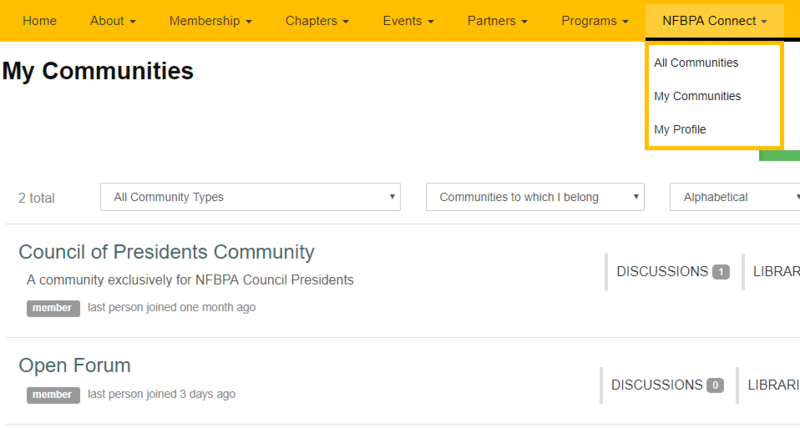 When you’re looking for meeting notes, official NFBPA communications, or other important documents, start in the Open Forum Community and then select Library. Your peers may have already shared exactly what you’re looking for. You can reference a file in your browser, or download, customize, and edit it to fit your needs – just be sure to give credit where credit is due! Return the favor by uploading files of your own to a community library, or by including them in an attachment to your discussion post. They all end up in the same place. Note: Like what you found? Take the time to rate and comment on the file; it will help others in the future. Discovery - Find information quickly and easily. NFBPA Connect comes complete with a robust search function that gives you the ability to locate posts and documents that contain exactly what you’re looking for. The search function crawls through communities, libraries, and member posts to return only the items that match your search criteria. 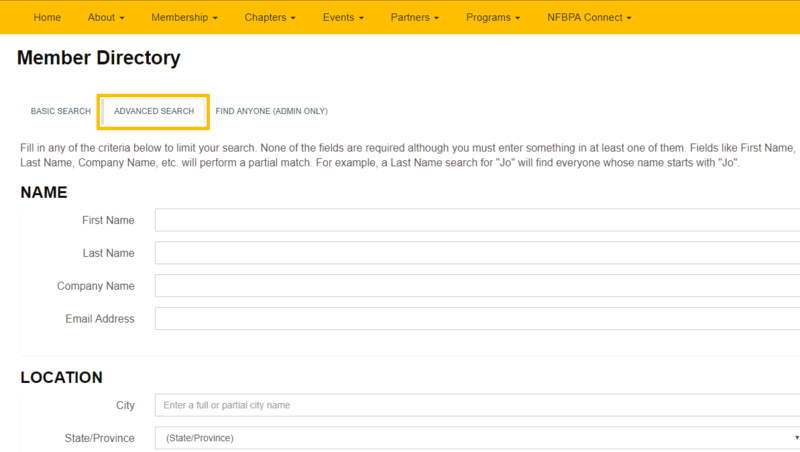 You can use the search function found in the Discussion area or Library area of a community to search just those modules, or use the general Search Box in the top, right-hand corner of the page to search the entire NFBPA website. Organize information and help others using the search function to find relevant posts and documents. Add a tag to a forum post or a library entry by using a hashtag sign, such as #Forum. Some tags will populate automatically, or you can create new tags "on-the-fly" by typing the # sign followed by the word you’d like to tag. @Mention – Reach Out and Connect! Reach out to fellow NFBPA members by utilizing the @mention feature. Type the @ symbol followed by the name of the person you wish to mention in your post. As you type, individuals that match the name will begin to auto-populate. Select the name of the person you are looking for once it populates. Note that for common names you may have to type the person’s full name to get a narrowed list. The people you @mention will received an email notification, letting them know to join the conversation and share their thoughts.